A better way to clean your pool . . . almost effortlessly!!! Scroll down to browse through information about Robotic Pool Cleaners, for all types of inground pools. These four (4) high performance, robotic pool cleaner models operate independently of the pump and filter and eliminate all the hoses, as well. There are choices from basic units for inground pools to remote-controlled, powerful units, for pools as large as Olympic-Sized. The Website Store Directory contains an alphabetized listing of all products for sale. We don't just sell products. We help you make a better-informed choice, by providing all the information, you might require. Need ordering help? Scroll down the page, for the Order Desk Telephone Help Number. All items ordered will end up in the same shopping cart, no matter which page of this website, the items are located. All Major Credit Cards and PayPal are accepted. Order one today. Robotic Pools Cleaners are easy, affordable way to clean your inground pool. No installation required! Just plug it in and you're ready to start cleaning. Operates with a safe, economic low-voltage power supply. No hoses to deal with! No priming! 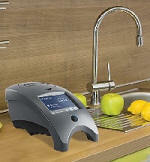 Does not require the use of the pool pump or the skimmer lines. The built-in microfilter bag removes even the finest dirt and acts as a second filter. Its movement around the pool improves circulation, while acting as a moving main drain! There is a model to suit your pool's requirements. The Robotic Pool Cleaners shown below all come with an applicable, authorized, factory warranty. Click any of the above images, to see a larger view. Shipping Size inches 20" x 17" x 17" 17" x 15" x 11" 20" x 17" x 17" 36" x 22" x 21"
Merge down the page, to place an order. For all types of above ground and inground pools, as well as spas and swim-spas. Choose from nine (9) models of hand-held, battery-powered Pool Vacuums. Capabilities range from spas, swim spas, leaf cleaning, pool touch-up cleaning, small or large inground or above ground pools. No hoses! Battery-Powered, Completely Self-contained. Less fuss and bother, Set yourself free!!! Use the link below for full details. Click any image for Product and Ordering Information. Scroll down to view the complete selection and to place an order. Shop with complete, on-line safety and security. Everyday Low Prices! Robotic Pool Cleaners, with their high performance/low energy engineering, use very little power and cost just pennies to operate! It helps the environment even more by reducing pool chemical consumption and increases water conservation by reducing the need to backwash your pool filter. ● Cleans and brushes all surfaces, in most pools, in 60 minutes or up to 90 minutes in larger pools. ● Maneuvers and turns in the pool, without walls or pistons. ● The Safest operating, 24 volt, robotic pool cleaner. ● NO FLOATS are needed, as with many other robotic cleaners. ● Approved for use by ETL, CSA, TUV, CE, GS. ● “Hex Wheels”- Heavy Duty Stainless Steel supported wheel tubes. ● Swivel on cord- No more cord tangling. ● Equipped with PVA brushes that will safely operate on all types of pool surfaces. ● Cycle Counter - Warranty testing. ● All motors are pressure tested under water to 1.5 atmosphere (17 feet.). ● Power Cord Length: 60 feet. ● Suction Power: 4200 Gallons per Hour. ● Cleaning Coverage: 3500 square feet per hour. ● Micro-Filter Porosity: 2 microns. ● Robotic Cleaner Weight: 16.5 pounds without cord. ● Shipping Weight: 36 pounds. Carton: 20" x 17" x 17"
● Drive Motor: 24v DC Oil Free High Speed Brushless. ● Pump Motor: 24v DC High Flow. ● Limited Factory Warranty: 1 year on motors. Scroll down to place an order. Click any Image to see an enlarged view. Limited Time Only Sale Pricing. Free Shipping, within the Continental U.S.
● Maneuver sand turns in the pool, without walls or pistons. ● Convenient Caddy Cart supplied, with every unit. ● The Safest operating, 24 volt robotic pool cleaner. ● Cycle Counter- Warranty testing. ● Suction Power: 4225 Gallons per Hour. ● More Powerful Cleaning Coverage: 5900 square feet per hour. ● Robotic Cleaner Weight: 16.5 without power cord. ● Shipping Weight: 46 pounds. Carton: 20" x 17" x 17"
● Limited Factory Warranty: 4 years or 500 cycles. ● Program Button - Can be programmed to clean floors only, walls only or both. ● Power Cord Length: 75 feet. ● Professionally Cleans and brushes most pools in 60 minutes, up to 90 minutes on larger pools. ● Suitable for Olympic sized pools. ● 4-way 360 degree wireless button Remote Control. ● Can maneuver turns in the pool without walls or pistons. ● Convenient Caddy Cart, supplied with every unit. ● The Safest operating robotic cleaner, running on 24 volts. ● NO FLOATS are needed as with other robots. ● 3 motors in unit- 2 drive motors, and 1 pump motor. ● Cord Length: 100 feet. ● Suction Power: 5019 Gallons per Hour. ● Shipping Weight: 81 pounds. Carton: 36" x 22" x 21"
Scroll down for complete shipping and returns policy. Shipping these products, outside of North America (US 48 states and Canada), can get expensive, due to the size of the shipping carton. Shipments can be made by UPS or Fedex, but there will be additional cost. Removes Iron, Copper and Manganese, as water flows through. Battery-Powered Portable Vacuums for Pools and Spas. Helps eliminate dead zones, that promote pool algae growth. Solves serious well water problems. Solves these problems, in pools and spas. No need to drain!!! New Nano-Technology destroys organic wastes and improves water clarity. have never been easier or more reliable. Swim Endlessly in Place, like a PRO. Do Aquatic Training in any type of pool. Using new technology, you can reduce chlorine or bromine usage and get better pool or spa results. 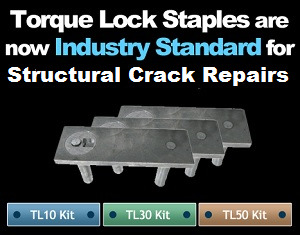 Torque-Lock Staples A Permanent approach to Concrete Crack Repairs. Outdoor Lighting Rechargeable, waterproof lights, for pools and backyards.